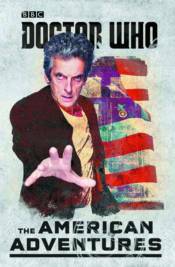 Travel through time and space with the twelfth Doctor in these six brand new adventures, set in a host of locations across the United States and eras from throughout American history. An invisible spacecraft turns up at the Battle of New Orleans in 1815, an alien presence is detected at the 1944 D-Day landings, and ghosts take over New York's subway tunnels as they're being dug in the early 1900s. Filled with mystery, excitement and the Doctor's trademark wit, these timey-wimey stories will delight any Doctor Who fan!